I found the forward slash in a circle symbol in an Italian lace knitting magazine. The instruction in Italian is 1 dir. crociato. The abbreviation dir. means diritto and that translates to knit stitch. Crociato means cross. In total, it is the instruction to twist a stitch, that is, to knit in the back loop. 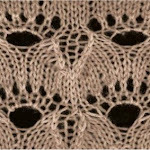 This causes the loop of the knit stitch to be crossed. The backward slash in a circle is in Italian 1 rov. crociato. The abbreviation rov. means rovescio or in English purl stitch. Therefore, it is also to twist a stitch, in this case by purling in the back loop to yield a purl loop that is crossed.